Washington (CNN) – A small edge right now in a key indicator of the midterm elections could lead to a big advantage for the Republicans over the Democrats come November. But according to the survey, which was released Monday, Americans are divided on whether they want Republicans to regain control of the Senate if they also retain their majority in the House of Representatives. "The results among 2010 voters is not a likely voter model because it is still too early to get a valid estimate on who is likely to vote this year. But looking at the 2010 electorate does help adjust for the fact that midterm voters are quite different from the general public or from voters who only vote in presidential years," says CNN Polling Director Keating Holland. "That three-point margin may not sound like much, but it's pretty much where the GOP was in the spring of 2010 before the party went on to take control of the U.S. House in November thanks to a 63-seat pick up, and made a major dent in the Democrat's majority in the Senate," Holland added. One caveat: While the generic ballot question is one of the most commonly used indicators when it comes to the battle for Congress, the poll results often are a long way from predicting what will happen in November, since there are 435 separate House races rather than one national race. Analysts often look other polling indicators. But many of those other indicators also seem to favor the Republicans right now. According to the poll, 43% of Americans say they approve of the job Obama is doing as president, with 55% giving him a thumbs down. The President's approval rating is unchanged from CNN's most recent survey, which was conducted in early March. The President's approval ratings are hovering in the low to mid 40's in most non partisan national polling this year, slightly above where he stood in November and December, when he hit or matched his all-time low in many surveys. Obama's approval rating is slightly better at this time in his presidency than his most recent predecessor, Republican George W. Bush, who was in the low to mid 30's in April of 2006, his sixth year in the White House. That November, thanks to a Democratic wave, the GOP lost control of both the House and the Senate in midterm contests. While a majority of those questioned say the President is not a major factor in their vote this November, a quarter say they will be sending a message that they oppose Obama, with one in five saying their vote will be a message of support for the President. "On the face of it, a majority saying that their vote is not based on their opinion of an unpopular president may sound like good news for Democrats," Holland said. "But President Obama has usually been the Democratic party's most reliable way to fire up the base, and this question suggests that Democrats won't turn out this year just because Obama asks them to. It's also worth noting that the current numbers are almost identical to 2010, when the President's party got shellacked in the midterms." And Democrats, more than Republicans, appear to have more work ahead of them when it comes to firing up the base. Conventional wisdom dictates that the GOP has an advantage over the Democrats in midterm contests. White voters and older voters, key to the Republican base, tend to cast ballots in bigger percentages in midterms than younger voters and minorities, who are an important part of the Democrats' base. The nation's unemployment rate now stands at 6.3%, the lowest level since September 2008. But according to the CNN poll, which was conducted after Friday's jobs report from the Labor Department, the positive news from Wall Street and Washington may not be resonating on Main Street. Many people just don't feel that good about things, and recent national polling indicates most people don't feel very optimistic about the economy and their personal plight. Only 38% of those questioned in the CNN survey describe the country's current economic conditions as good, with 62% rating them poor. There has been constant growth in the number of Americans who think the economy is in good shape - the 38% is a nine-percentage point improvement from last autumn, but the number with a positive view of the economy only increased by two points since February. At that rate, a substantial majority will still have a negative view of economic conditions in November. The economy remains the top issue on the minds of voters. Economic realities, as well as perceptions, will influence voters in the midterms. Even if this all adds up to a good year for Republicans, it may not mean the public wants the GOP in total control on Capitol Hill. The Democrats currently hold a 55-45 majority in the Senate (including two independents who caucus with the party). But the party's defending 21 of the 36 seats in play, with half of those Democratic-held seats in red or purple states. In the House, Democrats need to pick up 17 GOP-held seats to win back control of the chamber, a feat political handicappers say is unlikely considering the shrinking number of competitive congressional districts. According to the poll, if Republicans retain the House, 42% say they want the GOP to also win back the Senate. But 45% say they want the Democrats to keep control of the upper chamber. The poll was conducted May 2-4 for CNN by ORC International, with 1,008 Americans nationwide. 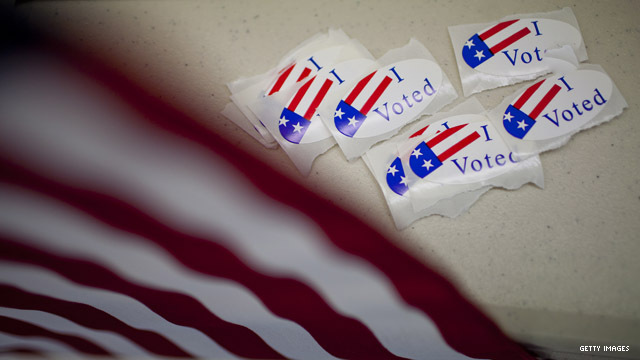 including 911 registered voters, questioned by telephone. The survey's overall sampling error is plus or minus 3 percentage points. "given the last 6 years, why would any educated person vote democrat?" "In the last election, the 10 least educated states voted for Romney. 9 of the 10 highest educated states voted for President Obama". – Intelligent people vote for progressive Democrats. Just the facts ma'am, from a conservative source. – When Bush left office we were losing 800k jobs a month!! How many did we lose last month? – When Bush left office the stock market was in the toilet. I personally lost 100k in investments, but in the last 6 years I have recovered all of it and then some. – My borther in law is ALIVE today because of Obama care. Blake, support your percentage claims with verifiable facts. Tom, What about the millions that lost their insurance due to Obamacare? What about the millions that lost their doctor they were told they could keep. Take you rose colored glasses off and drink a cup of reality! obamacare affects everyone and a majority do not like it or the lies that made it happen. also it's a 100% democrat program. The Republican advantage?? Same as it's always been, "Appealing to the uneducated, paranoid & weak-minded". Unfortunately, the US has no shortage of GOP minions. Seriously? You really just said that about repubs? Hilarious. the Dems are the ones who make a living off the uneducated, paranoid, and weak minded. Was your comment meant to be sarcastic? Well, but CNN's polls virtually guaranteed me that MittWitt was a sure thing. The news media should spend much less time reporting polls and predicting the outcome of election and much more time on the issues and candidates stands. 90% of election coverage is on polls and predictions. Very little on the issues. No wonder we are so messed up. The news media should spend much less time reporting polls and predicting the outcome of election and much more time on the issues and candidates stands. 90% of election coverage is on polls and predictions. Very little on the issues. No wonder we have so many problems. So you think having an insurance policy that you pay 50 dollars a month for is a good thing. Regardless of whether or not it would even cover a nose bleed. You need to lay off the tea and drink a large cup of reality. Give Obama a break, people. He's just a puppet, a scapegoat for the people with the real power. Republicans, Democrats, Indepenents. It makes no difference. The course of events remains the same.The people in charge of this country remain hidden behind this show of politics. Take a stand, Dont vote. It makes no difference who's in office.